Only 7 left in stock at this price! Opium For Men by Yves Saint Laurent is an oriental fragrance for men. This spicy scent contains notes of black currant, star anise, galanga, pepper, tolu balsam, cedar and vanilla. 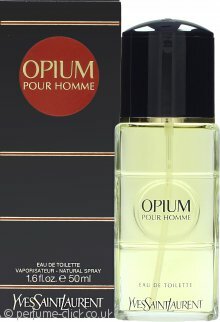 Opium For Men was launched by Yves Saint Laurent in 1995. Yves Saint Laurent Opium for Men Eau de Toilette 100ml SprayGREAT FRAGRANCE !!! Bought this for my dad's 73rd birthday and he loves it. Arrived in perfect condition and was the perfect birthday present. I bought this as a gift and it was well received .. the smell is gorgeous and lasts so well worth the price! Definitely recommend.